Provide comfort for the family of Bruce Johnston with a meaningful gesture of sympathy. Bruce Victor Johnston was born in the Town of Carman on April 13, 1926 to Frank William Johnston and Ida Gertrude Faulkes Johnston. His father worked for the Canadian Pacific Railway and moved his family to Gretna when Dad was a very young child. The Town of Gretna was established along the line of the Canadian Pacific Railway in 1881. Dad’s paternal grandparents lived in Carman and from a young age, Dad would routinely take the train from Gretna to Carman to visit them all by himself. His grandmother would prepare him a meal and after visiting with her, he would hop on the train for the ride back home to Gretna. Since his father worked for Canada Pacific Railway (for 40 years), Dad could travel for free. When Dad was still a teen, he worked for Canadian Pacific Railway in Gretna as well as in Vancouver. At the age of 17, with Canada involved in World War II, Dad wanted nothing more than to serve his country. He joined the Canadian Armed Forces only to be sent back home when it was discovered he was too young. Determined, Dad changed the date on his birth certificate and reapplied. This time Dad was successful as it was deemed that he was close enough to the age of 18. Next Dad went to a Canadian Forces station at Camp Debert, Truro, Nova Scotia where he received infantry training in preparation for the move overseas. The war in Europe ended, however, and Dad was given 30 days leave which he spent with his family back home in Gretna. During that time, he heard that 30,000 soldiers were needed to fight in the Pacific. Against his mother’s wishes, he boarded a troop train to Vernon, British Columbia, where the Canadian Army Pacific Force (CAPF) training base was located. But then the war was declared over and Dad once again returned home by train. Not being able to serve overseas remained a lifelong disappointment for Dad. While waiting for his discharge, Dad lived at the Fort Osborne Barracks and attended classes at the University of Manitoba where he completed his grade 10. For a few years, Dad worked at a mine in Red Lake, Ontario. As a result of a serious accident, Dad fractured all of the bones in one of his hands. When he was 25, on a visit home, he was offered a job working for InterProvincial Pipe Line which had a station in Gretna. Dad worked for IPL (now called Enbridge) for more than 37 years, retiring in 1989 as pipeline foreman. He enjoyed his job very much. In 1968, Dad attended a servicemen’s banquet in Winnipeg. There he met his future wife, Bernice McKenna, a young widow with four children between the ages of 10 and 14. After a three month courtship, Dad married our Mom. We left our home in Winnipeg in the Spring of 1968 for our new home in Gretna. Dad was a wonderful and loving husband to our Mother and the dearest possible Dad, grandfather, and great grandfather. His kind, gentle, and stoic nature was always present. We were truly blessed from the day he came into our lives. 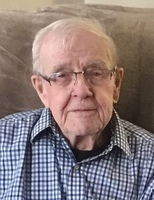 Dad passed away at Golden Door Geriatric Centre in Winnipeg on January 27, 2019. He was 92 years. He will be sadly missed. A memorial service conducted by Reverend Kevin MacDonald will be held in Gretna on Sunday, March 3, 2019, 3:00 p.m. at the Gretna Prairie Centre, 597 Hespeler Avenue, Gretna. Burial will take place at Brookside Cemetery. To send flowers in memory of Bruce Johnston, please visit our Heartfelt Sympathies Store. We encourage you to share your most beloved memories of Bruce here, so that the family and other loved ones can always see it. You can upload cherished photographs, or share your favorite stories, and can even comment on those shared by others. Provide comfort for the family of Bruce Johnston by sending flowers. Sincere condolences to uncle Bruce's family and friends from Pearl and Peter Davis. We sure enjoyed our visits with uncle Bruce in his later years and will miss him dearly. Our times with aunt Bernice and uncle Bruce were always fun, informative and lively. They were precious moments in time and uncle Bruce and aunt Bernice are both missed greatly and thought of often with both sadness at their passing and gladness for having them in our lives. They and the good times spent with them shall be forever remembered forever loved. Thinking of the family and offering prayers.